Are Irish People More Intelligent Than Americans Or Do They Have Less Morals? Michel Lewis published a book in 2011 titled "Boomerang: Travels In The New Third World," where he looked at the post 2008 financial crisis world and provided one of the first introductions to the new sovereign debt crisis world. One of the chapters of the book was focused exclusively on Ireland. It showed the incredible build up to 2008 and the spectacular collapse that followed. Vanity Fair published the chapter in its entirety, which you can read here: When Irish Eyes Are Crying. This morning Barry Ritholtz published the following chart on his site, which he called the single most insane chart he has ever seen. 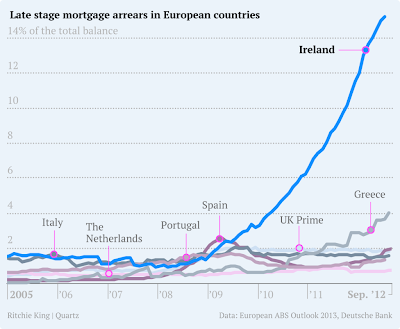 It shows the percentage of mortgage loans in Ireland that are 90 days past due. This number has now risen to 16% of all mortgages in the country. 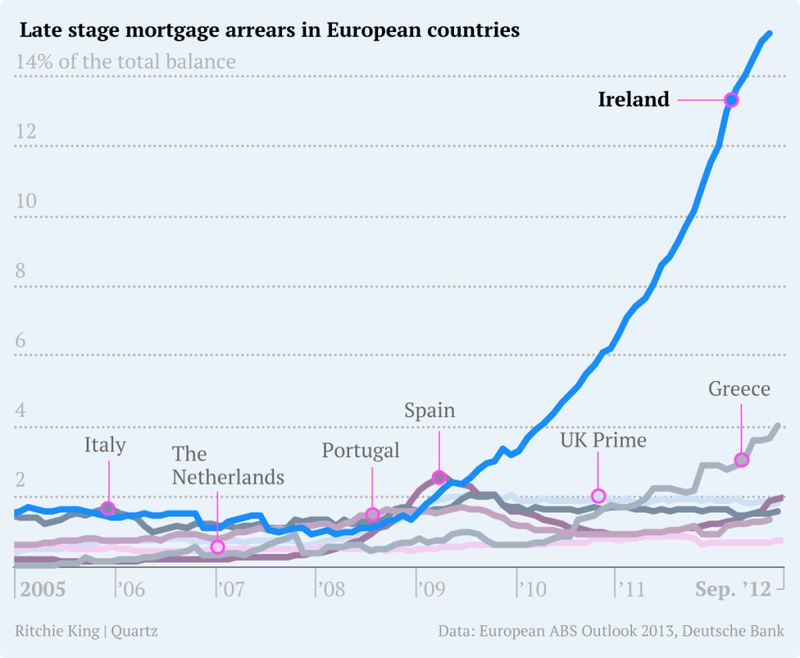 The chart comes from an excellent article written this week from Quartz titled Welcome To Ireland, Where Mortgage Payments Are Apparently Optional. The article picks up where Michael Lewis left off and provides a real time update on the state of Ireland's banking system and sovereign debt crisis. I highly recommend reading both the chapter from Lewis and the article from Quartz. What I want to do is go one step beyond their discussions and relate it back to what is taking place here in the United States. The chart above shows those that are 90 days past due on their mortgages, meaning these Irish residents are living for free in their homes. Estimates are that 35% of those living for free are "strategic defaulters," meaning they have the ability to pay but choose not to. After reading about the law changes making it very difficult for Irish banks to foreclose on property, I would guess that 35% is a conservative estimate. By the fourth quarter of 2009 in the United States nearly 7% of mortgages were delinquent, or 60 days past due. This was caused mostly by the unemployment rate rising and many families not having the ability to continue paying the mortgage. As the economy has improved, the number of delinquent mortgages has fallen back down to 5.19% - the lowest number in 4 years. Here is what makes the story very interesting. We know that well over 10% of the mortgages in America are still under water, meaning that the owner owes more on their mortgage than their home is worth. When you factor in the cost to sell a home (6% Realtor fee plus closing costs), the number of real under water Americans is far higher. That means that at the most conservative estimate at least 5% of Americans with a mortgage are making their monthly mortgage payment while their home is under water (the real number is much higher). This concept is just incredible to me. These people work extremely hard all week long to throw their money into a black hole. It is like taking their paycheck to the local check cashier every other Friday, then coming home and setting it on fire. I understand that every circumstance is different and I'm not recommending that any individual stop making their monthly payments without considering all aspects of their personal situation. I am only talking in generalities. 2.They believe it is the morally responsible thing to do. I am willing to bet that if Americans took just a few hours to learn about how money is created or how the financial system worked, they would think much harder about making that payment every month. When a bank lends you money that money is loaned into existence. The money did not exist before you signed the paperwork. There is not an old man somewhere who worked really hard, saved all his money, and opened a bank so he could lend you the money. Your loan is an electronic note on a ledger. It is an asset that was created out of thin air. If you do not understand this please see 2013 Outlook Addendum: Modern Money Mechanics. Why are there hundreds of thousands of Americans who have been living for free in their homes for years? If the banks were to foreclose and sell the property they would be forced to take a loss on their balance sheet. If they do not foreclose then they can continue to keep the asset at full value on their books. Extend and pretend. Welcome to zombie banking America. The only difference between what takes place here vs. what takes place in Ireland is that the Irish choose to keep their money. Americans feel it is their responsibility to send it back to the banking system every month. Then they go to dinner parties and talk about how unfair it is.